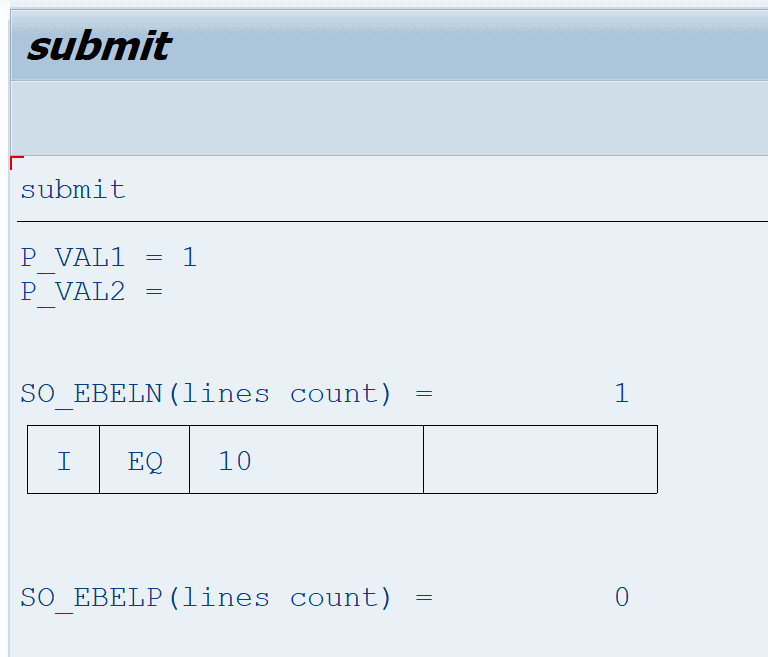 Below is example code snippet to use the ABAP SUBMIT statement within your SAP report programs so that you can execute a second report with the required values. And control whether the process flow then returns to the original report or ends with the call report. ls_seltab LIKE LINE OF lt_seltab. SUBMIT ZTEST_SUBMIT WITH SELECTION-TABLE lt_seltab AND RETURN. We will now try to delve a bit deeper into the submit command and provide examples of most if not all the functionality you may need to use. First here is an example ABAP report that we will use for demonstration purposes and will call this report using the SUBMIT command in various different ways. wa_ebelp LIKE LINE OF so_ebelp. WRITE: / 'P_VAL1 =', p_val1. WRITE: / 'P_VAL2 =', p_val2. ld_lines = lines( so_ebeln ). WRITE: / 'SO_EBELN(lines count) =', ld_lines. LOOP AT so_ebeln INTO wa_ebeln. wa_ebeln-low, sy-vline, wa_ebeln-high, sy-vline . DESCRIBE TABLE  so_ebelp LINES ld_lines. WRITE: / 'SO_EBELP(lines count) =', ld_lines. LOOP AT so_ebelp INTO wa_ebelp. WRITE:/  sy-vline, wa_ebelp-sign, sy-vline, wa_ebelp-option, sy-vline, wa_ebelp-low, sy-vline, wa_ebelp-high, sy-vline .